Up till now, the only serial killers Tony Hill had encountered were safely behind bars. This one’s different – this one’s on the loose. In the northern town of Bradfield four men have been found mutilated and tortured. Fear grips the city; no man feels safe. Clinical psychologist Tony Hill is brought in to profile the killer. A man with more than enough sexual problems of his own, Tony himself becomes the unsuspecting target in a battle of wits and wills where he has to use every ounce of his professional skill and personal nerve to survive. Terrifying but stylish, cruel and compassionate. Truly, horribly good. Think of psychological profiling and TV’s Cracker springs to mind, but McDermid’s latest thriller goes one better — a must for all crime fiction lovers. A deliciously gruesome serial killer thriller. Ms McDermid finds new ways to shock and revolt us. Turns the serial killer subgenre upside down with compelling but gruesome results. McDermid has many startling surprises in store and brilliantly pulls the rug out from under our feet, exploding the psychological cliches commonly found in more one-dimensional portraits of the twisted criminal mind. This is without doubt the best book by McDermid that I have read: exciting, well-written, fast-moving and well-deserving of the [Gold Dagger] award… you’ll not find a better book this year. 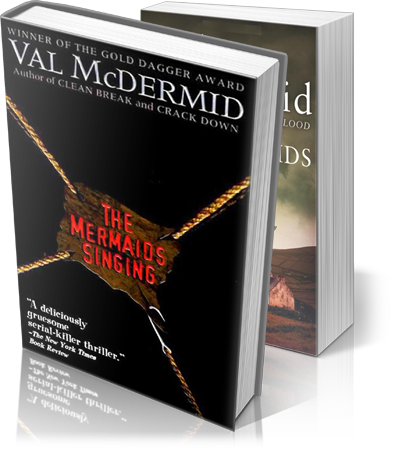 [McDermid] excels because she explores the mind of a murderer, gradually teasing out details; then switches effortlessly to the police investigation… MERMAIDS is… well-written, tense and exciting. It is a book which pulls the reader, and which lingers in the imagination long after the last page has been turned.